TALLAHASSEE, Fla. – Florida State coach Jimbo Fisher met with the media Monday to recap last week’s 26-19 win at Wake Forest and look ahead to Saturday’s rivalry game against Miami (3:30 p.m., ESPN). Here are highlights from that conversation. Florida State’s victory over Wake Forest last week was the first win of what the Seminoles still believe will be a season full of them. But they went to Winston-Salem in need of that first one and, after claiming it in dramatic fashion, Fisher hopes that it will spark his team to play at the level required to beat some of the teams remaining on FSU’s schedule. That starts with a visit from No. 13 Miami this week. He acknowledged that there was some frustration throughout the first month of the season and, at one point, even fielded a question about whether the team was having fun. Having fun, he noted, is a lot easier for everyone when the team is having success. Florida State’s offensive linemen were the walking wounded on Saturday, with left tackle Derrick Kelly missing most of the game with an apparent leg injury, and fellow linemen Cole Minshew, Rick Leonard and Landon Dickerson all sustained minor ailments during the contest. There’s a chance, however, that the Seminoles could be at full strength up front when the Hurricanes visit on Saturday. Speaking of the offensive line, Fisher addressed some of the challenges that FSU’s linemen had blocking the Demon Deacons on Saturday. Wake Forest finished with 17 tackles for loss that cost the Seminoles 70 yards. Fisher said that technique and communication were most often to blame for the breakdowns. And, sometimes, Wake Forest’s talented defensive front simply made plays. The report wasn’t all bad, though. Fisher said he still likes the line’s collective attitude, approach and willingness to keep at it. Sparked by junior Jacques Patrick, FSU’s rushing attack last week had its best effort of the season. 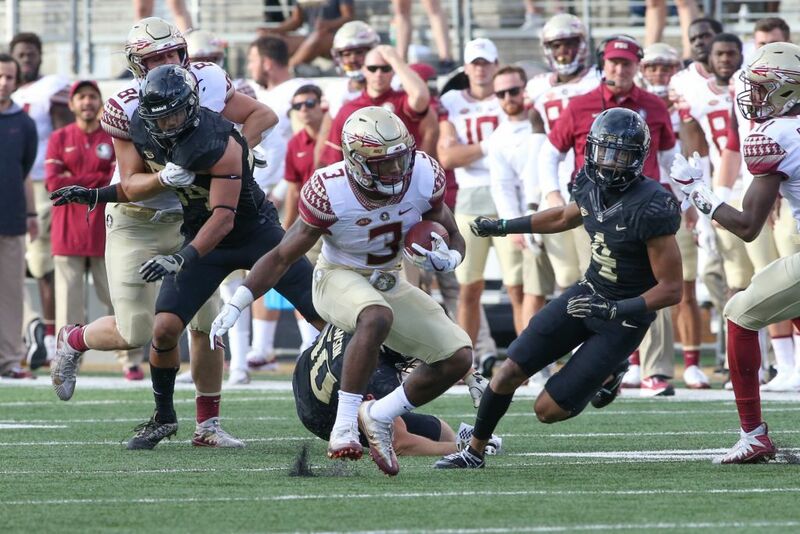 The Seminoles totaled 149 yards on the ground – a number heavily skewed by sack yardage – with Patrick accounting for 120 and freshman Cam Akers adding 58. It was an encouraging sign, and Fisher believes things will get even better as Akers gains more experience. But Fisher said that’s a common issue for freshmen, and that Akers is in pretty good company in that regard. Florida State has a seven-game winning streak against Miami, but that doesn’t mean the Seminoles’ run of dominance has always come easily. Those seven wins have been decided by an average of 11.7 points, with the last three featuring margins of four points, five points and one point. This year’s Hurricanes are 3-0, coming off a comfortable win at previously-unbeaten Duke and have a roster that Fisher believes is as talented as any they have had during his time as FSU’s head coach.